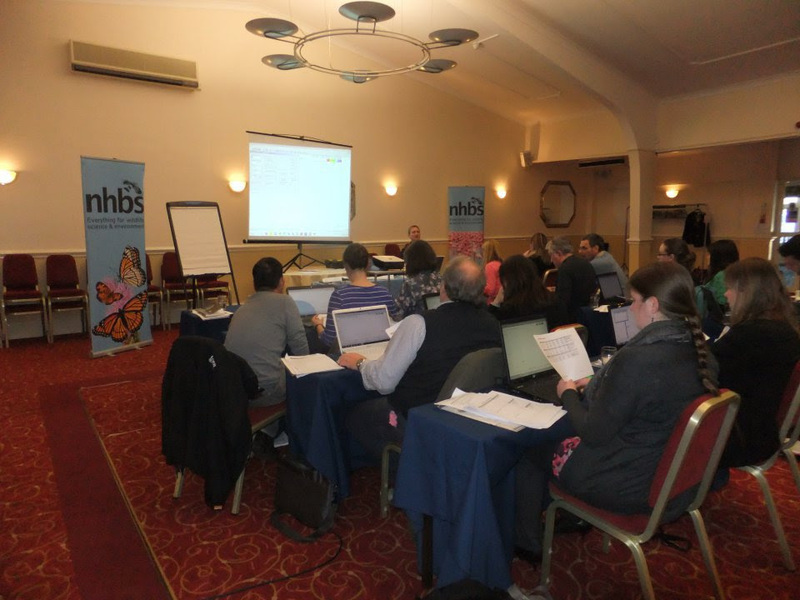 UPDATE 7th MARCH 2016 – The Bat Survey Training Course has now been cancelled. The use of passive monitoring to assess bat activity has important implications for how we work with the vast amounts of accumulated data, and automation now plays a crucial role in dealing with datasets which often contain thousands of recordings. This bat survey training course has been designed to give you insights into the how-to of passive acoustic bat detection and call analysis, including its pitfalls. It will give you the skills to conduct passive acoustic bat surveys with confidence and to analyse your results in the most efficient and accurate way. Topics covered will include: Why and where do we listen for bats, how to detect bats, signal analysis, bat call identification and working with large datasets. It will also include a short introduction to the Batcorder system. The course will be held at the Preston Montford FSC Centre in Shropshire on 9th-10th April 2016. It will involve a combination of classroom-based learning and fieldwork and will be led by Volker Runkel from the German company ecoObs, manufacturers of the Batcorder system. 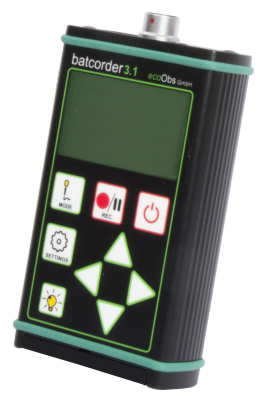 ecoObs are a small German company at the forefront of full spectrum bat call recording and identification. 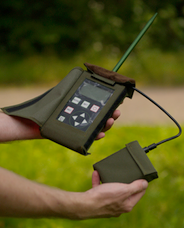 They produce the Batcorder 3, a highly optimised bat detector (each new microphone arrives with its own calibration factor to ensure that comparisons between units are valid) designed to consistently record bat calls of sufficiently high quality to make auto-identification possible. Calls can then be processed using ecoObs software bcAdmin 3.0, bcAnalyse 2.0 and batIdent. These enable the rapid and accurate identification of common bat species, speeding up the identification process by up to 70% and allowing users to focus more time on rare or interesting bat species. We asked ecoObs co-founder and managing director Volker Runkel to introduce the company. For my PhD thesis I developed a quite basic and rather well working solution for passive monitoring of bats. Already then I saw that automation in data collection as well as analysis was one of the keys to focus on, instead of all raw analysis work. We quickly realized there is a huge demand for such a solution. We then were lucky and found an engineer who partnered up with us and redesigned the hardware so it was power efficient, small and easy to use. The batcorder system was born. 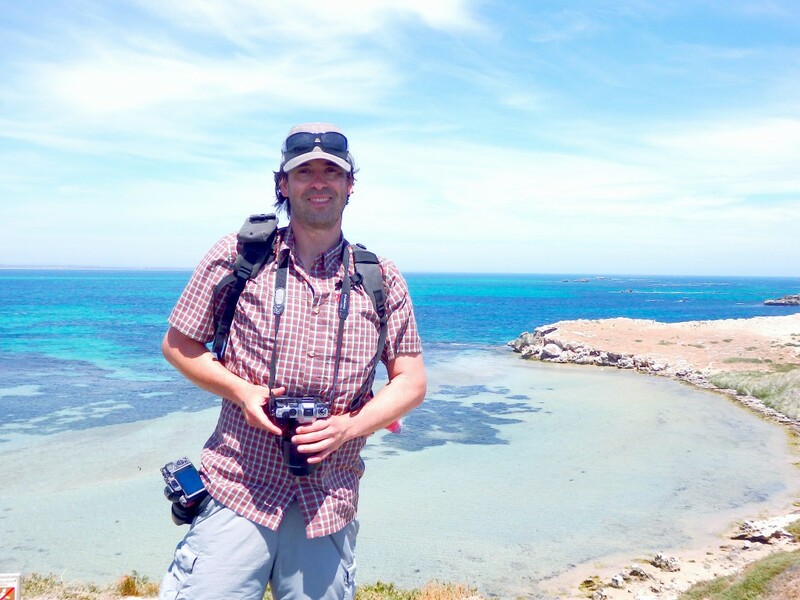 What challenges do you face as a company in the ecology/natural history sector? The sector is rather small and as a hardware producer we for example often have problems acquiring small quantities of parts. In electro-engineering small companies still require some hundred thousand parts while we ask for a mere thousand. Also the demand for devices is highly seasonal – 90% of orders arrive within a few weeks in spring when the bat season starts. On the other end, we have a very vivid and heterogeneous bat worker scene. What do you consider the most important achievement of your company in recent years? I think getting the batcorder and the analysis software out in the wild and thus pushing the whole field of passive monitoring and automated bat call identification to where it is now. When we started in 2004 no one believed it would be ever working, and now a rising number of devices and software exists. What is your most memorable wildlife/natural history encounter? Spotting and touching an Echidna in the wild! By automatically analysing bat calls, the Batcorder will save you significant amounts of time. The exceptional quality of recordings made by the Batcorder means you can be more certain of correctly identifying a species either automatically or manually. Automatic species identifications can be carried out in a few minutes (watch our short video to see the process in action). The unique omni-directional microphone, as well as the reduction in echoes from the main body of the unit, ensure a clear picture of bat activity at the recording site. The sensitive bat call trigger ensures that the vast majority of recordings made by the Batcorder are from bats. Recordings of other sounds (crickets, rustling leaves, water, wind and wind turbine movements) are under most circumstances not recorded at all. In contrast to other bat detectors, each Batcorder and its microphone are calibrated for a fixed sensitivity. Thus, the comparison of bat activity recorded at different locations is guaranteed to be unbiased. 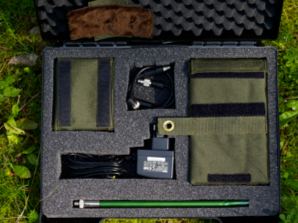 The Batcorder is a weatherproof autonomous recording device designed to be left in the field for multiple nights. It has a typical battery life of 6-10 nights (based on the level of activity at the site), and space for 30,000 calls (when using a 32GB SDHC card). A special Wind Turbine Extension Kit allows continuous deployments in excess of 30 days to minimise the need to access the in situ Batcorder. The entire Batcorder System has been designed by bat workers for bat workers. It’s user-friendly with an intuitive powerful call management system, allowing you to download, analyse, catalogue and search for calls easily. You don’t need to go on a training course to get started with the Batcorder. The Batcorder is distributed in the UK & Ireland by NHBS. If you’d like to find out more, please contact Dr Adrian Gude, NHBS Wildlife Equipment Specialist. The Batcorder and associated software is the most advanced bat detection and identification system available. Fast becoming the most popular choice in continental Europe, the Batcorder is set to revolutionise your bat work. Read on for a brief introduction to the Batcorder system and how it could benefit you. The Batcorder is the most advanced sound recorder available; such a high quality recording is essential for later analysis using the automatic recognition software. It records bat calls in real-time, whilst excluding other sounds such as crickets, rustling leaves, etc. Simply leave the Batcorder out in the field (battery life is 8 to 10 nights) and it will make high quality recordings (500kHz / 16 bit) of every bat call. Calls are recorded on an SDHC card (up to 32GB). The Batcorder is waterproof and fully programmable. Most importantly, the Batcorder features an omnidirectional microphone mounted on an extender. This eliminates reflection from the main body of the device whilst maintaining 360 degree coverage. The slim microphone tip minimises distortion, which can be a problem with other detectors that have wider microphone membranes. Once you’ve got your recordings, bcAdmin provides an intuitive software package to manage the data. Individual calls are stored in connection with location, call length, time and other information. Search functions exist to aid in finding individual calls. Most importantly, bcAdmin automatically prepares the data for analysis using batIdent. Once the analysis is complete, bcAdmin can present the data in a variety of forms to provide instant graphical representation of bat activity. 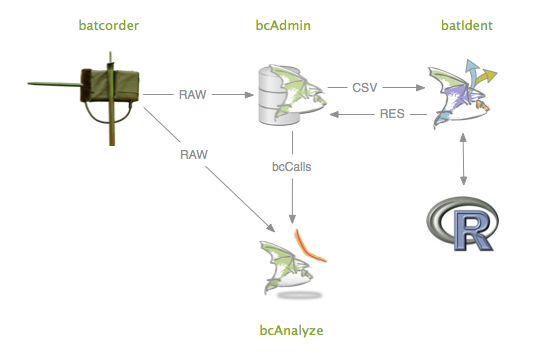 At a click of the button, bcAdmin will import bat calls into batIdent, the freely available call analysis software. batIdent has a call library of 77,000 bat calls (and counting!) which can be used to identify 27 species from 11 genera (with some species only to genus). Utilising the freely available statistical package R, batIdent performs single call analysis in a multi step process. Illustrated below is the decision tree which it uses to identify bats. 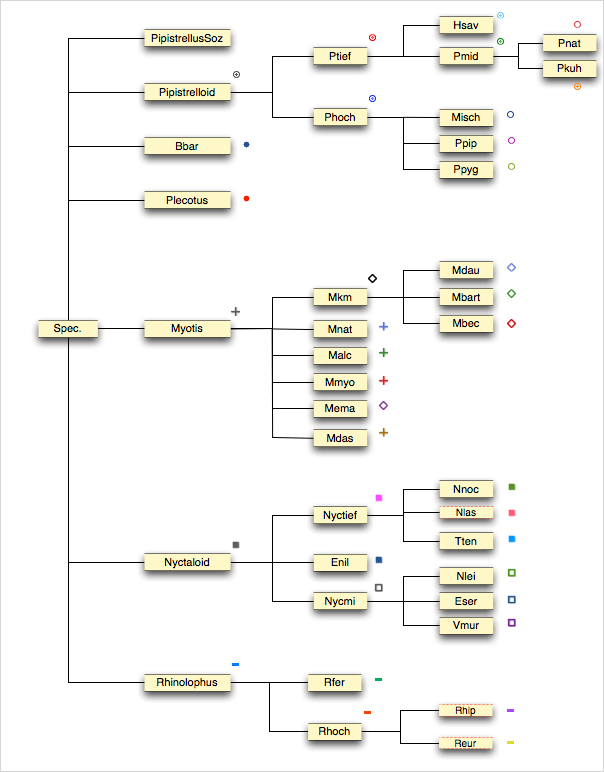 The tree also shows which bats can be identified by batIdent to species and which bats to genus. Currently the call library covers all mid and northern European species and most Mediterranean species. During a typical analysis, batIdent will identify 85% of the calls recorded. The remaining 15% will be excluded as the recording is of insufficient quality or duration to make a positive identification. Up to three species can be identified in any one recording and a percentage probability is provided for each species identification. For those wanting to perform additional manual analysis on calls, the additional software package bcAnalyse is also available. 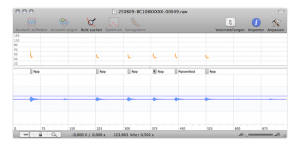 bcAnalyse lets you view the oszillogram, spectrum and sonogram of the sound file. The user friendly design means you can quickly browse calls and select sound to be transformed into a sonogram or spectral display. 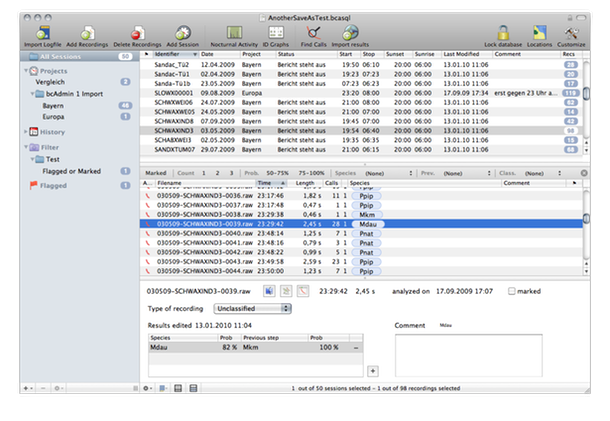 bcAnalyse allows you to manually confirm batIdent results or analyse recordings made using other systems. The Batcorder system scales effortlessly for large projects. Each microphone is supplied with a correction factor, so recordings from different Batcorders can be directly compared. Check out the Wind Turbine Extension to find out how the Batcorder can be deployed for wind farm studies. bcAdmin and batIdent eliminate the time taken for lengthy call analysis. Both the Batcorder and software packages have a proven track record and are on their second or third versions following improvements from earlier versions. Click on the relevant link for more information on the Batcorder, Software and Accessories.